The 14mm f/2.8 IF ED UMC Lens for Nikon with AE Chip from Rokinon gives you approximately a 115° view with dramatic results when used with a full frame digital camera or 35mm film camera. It includes a special chip that allows the lens to work with the camera's focus confirm, auto exposure, auto metering and auto white balance functions. With hybrid aspherical lenses, you will produce sharply defined images with a minimum of distortion and chromatic aberrations. This manual focus 14mm lens focuses as close as 0.9' / 28cm from the lens, and has a built-in petal-type lens hood. With some cameras, Shutter Lock must be disengaged on the camera's menu. Box Dimensions (LxWxH) 7.1 x 5.0 x 4.6"
14mm f/2.8 IF ED UMC Lens For Nikon with AE Chip is rated 4.5 out of 5 by 203. Rated 4 out of 5 by jwstump1 from Great lens at a great price I have only had the lens for a month at this point, so my review is still at an early stage. I bought this lens as I primarily shoot landscape and wide-field astrophotography, so I am not worried about AF. That being said, for sub $, this lens is the bomb. I cannot express how happy I am with the results of the performance of this lens. I have attached two wide-field shots I did less than 24 hours after I received the lens. This lens is great when you don't need AF. Performance is on-par with the Nikkor 14-24mm and the Zeiss. Each lens has its pros and cons, but for less than $, this is a steal. If you have a Full-Frame and don't want to break the bank on your first lens, then start with this. Rated 5 out of 5 by Copelan from It's really sharp on my Nikon D800 The lens is amazingly good. Yes, it has distortion (which can be mostly corrected in Photoshop or Light room) but it's sharp at the edges of the frame and the corners of the images are sharp too on my D800. And we are talking about shooting the lens at f/4. I also own a Zeiss 21mm ZE and a Canon 16-35mm f/4 IS lens for my Canon 1Ds3. The Rokinon is just as sharp on a Nikon. Is it built as well as a Zeiss or Canon L lens? The answer is no but it is really cheap and a blast to use. Would a Zeiss 15mm be nicer? Yes it is because it is lower distortion. I've used the Zeiss 15mm and like it a lot but the Rokinon is really pretty close except for the distortion and of course the build quality. Rated 5 out of 5 by Anonymous from Hidden gem Perfect lens for landscapes/night sky photography. This lens makes super sharp pictures, but keep in mind this is a MANUAL focus. The confirm chip however is there to guide you to achieve perfect focus in addition to the focus ring that is huge and easily maneuverable. The lens produces noticeable mustache distortion but this is easily fixable using Lightroom lens presets. Also not forget it does give 115 view on a full-frame (35mm) but only around 94 view on APS-C sensors. It does add some vignette but IMO I really like this alteration. I would recommend purchasing other Rokinon/Bower/Samyang products. Rated 5 out of 5 by Anonymous from Exceptional wide angle lens This is an excellent lens, if you want to get into wide angle shooting this is the absolute best choice for the money in my opinion. The chip communicates with my D810 nicely, but even with focus confirmation there is a small range of focus that is indicated as acceptable. To be sure of your focus the 100% zoomed in live view is the way to go. Build quality is excellent and the cap while bulky gives good protection. I find it's easy to stash it under my arm while shooting. All in all I love this lens, nice sharp images and easy to use if you don't mind manual focus. Rated 5 out of 5 by Detailking from Best bang for the buck! This is probably the best wide angle lens you can possibly buy for the money. Sure it's not Nikon quality but it sure is not over a thousand dollars either. Using it with a Nikon D750. In my opinion so far, the lens is nice and sharp. Manual focus is a learning curve but I'm overcoming it. There is distortion which is easily fixed in a lens profile easily available online. Overall I'm very pleased with this lens and have received many compliments on my photos that have been taken with it. It's a win-win with this lens. Buy it now and thank me later. Rated 4 out of 5 by BillT from Great Lens This is such a fun lens to use. Its my first ultra wide angle lens and its field of view is great for getting interesting shots. Focusing can be tricky, but that's more a camera and my eyes kind of a problem rather than the lens. No its not sharp in the corners, and neither are most lenses like this, but its crisp most of the way through once you're stopped down to f8-f11. The build quality is good and it feels nice and solid. The focusing ring is beautifully smooth and a joy to operate. All in all, for the money, you can't go wrong. Rated 5 out of 5 by Jurgen B. from Excellent option for lightweight ulta-wide angle lens Razor sharp lens between f/4 and f/13. Even at f/22 still highly acceptable results. (Measured center sharpness at f/2.8 is poor, worse than f/22). Pictures are color rich. Manual focus and no stabilization are not an issue for landscape work. Handholding during the day is fine, and at night you need a tripod with or without image stabilization. Very light weight. Get's a little more bulky with a CPL filter (3rd party, e.g. Wonderpana). However, overall, this lens is at around $300 and about 500-700g lighter than any high-end ultra-wide angle zoom lens (such as Nikon 14-24 or Tamron 15-30mm, I own the latter). A pleasure to work with and pictures look very lively. Distortion and vignetting are easily removed in post-processing. So clear recommendation. Rated 4 out of 5 by Chitinaking from My best lens for Aurora (Northern Lights) Photography. 99 percent of the time I use this lens for my photography for Northern Lights here in Alaska. The 115 degree view is needed to capture as much of the sky as possible. Manual focus is a must when shooting at night. I use this lens with my full frame Nikon D750. As with all wide angle lenses focusing is challenging especially in the dark with dark skies even with the added AE chip. I love this lens! This is a fully manual lens. 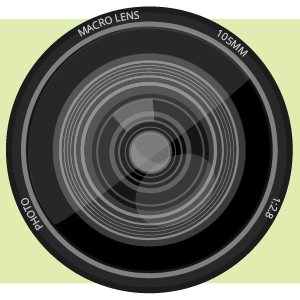 The focus confirm chip enables the use of your camera's focus confirm feature. If you are having trouble with your camera firing witht his lens, you may want to try disengaging the shutter lock setting on your camera's menu. 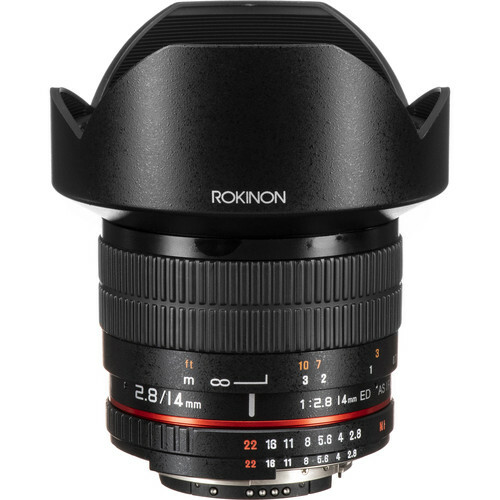 Unfortunately, the Rokinon 14mm Ultra Wide-Angle f/2.8 IF ED UMC Lens For Nikon does not have a front filter thread due to the convex design of the front element. These are all basically the same lenses with a slightly different window dressing on the outside. This lens is compatible with the Nikon D5300. Does this work with the Nikon D60? It's a manual focus lens so it should work just fine on any of the Modern Nikon DSLR's. Will this fit Nikkormat FT2? Yes, the Rokinon 14mm Ultra Wide-Angle f/2.8 IF ED UMC Lens For Nikon With Focus Confirm Chip would be compatible for use on the Nikon Nikkormat FT2 35mm film SLR camera. Is it meant for full frame or will it act like a DX lens? I want to know if it will downgrade my MP on my D800. I bought the lens to use on my D800E and it works at full frame. A very sharp lens, little bit of distortion which can be corrected in Photoshop. Well worth the price. does this lens cause distortion? Yes, there is distortion. I use a lens correction profile I got from Abobe's lens profile downloader, which seems to work fairly well. The profile is called Samyang 14mm, which is the same lens. I plan to 3D print a square filter holder for my Rokinon 14mm lens. I use this lens exclusively on Full Frame bodies. I am not sure if I need 100mm or 150mm filters to avoid vignetting in the corners. Any recommendations? I havent used a filter system with this particular lens however having used the 100mm system with my 16mm wide angle lens, I would highly recommend you going for the 150mm system. You want to be wider than narrow reducing any chance of vignetting.